1. What is the “Learning Communities” Program at NJIT? 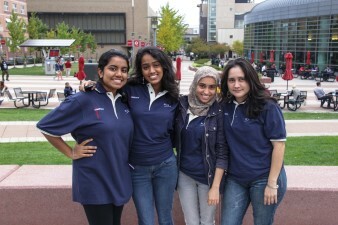 Learning Community is NJIT’s version of learning communities. Twenty to thirty freshman students enrolled in the same major take 2-3 courses together, forming important relationships throughout the year with each other and peer mentors while developing skills that they will use throughout their academic career and beyond. The program continues into the first semester of the sophomore year to help students transition to increasing academic demands within their major. 2. Who can be part of a Learning Community? First-year, full time students who are not currently associated with other cohorts at NJIT: Albert Dorman Honors College, Educational Opportunities Program, the Apt To Succeed program, or the College of Architecture and Design. The program seeks to provide access for “regular admit” students to the same benefits of other cohorts on campus. 3. What professors and advisors are part of Learning Community? First-year professors and academic advisors in the student’s major who are aware of his or her academic and social progress. The faculty and advisors work as a team to guide students inside and outside the classroom. 4. Who are peer mentors and what is their role? Peer mentors are sophomore or junior level students who take a leadership role in guiding first-time students. Mentors have identified themselves strongly with their major (i.e. through club activities, co-op experiences, and other levels of professional development) and have established a network of affiliations with the broader NJIT community. They are experienced with team building and are prepared to facilitate the formation of study groups and connect students with faculty and available campus resources (like tutoring and counseling). Peer mentors are typically assigned to about 12 students in a learning community and engage with students online, in select classes, and other group activities. and pi of contact for communicating questions or concerns. 5 . How many students will be in each community? Each community will have twenty to thirty student members depending on the major. 6. Do I take the same classes as my other community members take? Each major has a set of core first year classes according to the curriculum. Students in learning communities are grouped together in two or three of these classes. 7. What activities will I be participating in as part of Learning Communities? Besides attending classes with the community, students will participate in a variety of academic and social experiences including team projects, community service, academic seminars, résumé and portfolio building, tutoring and career counseling. 8. How does Learning Community benefit me in the short-term? Long-term? In the short term, Learning Community will establish a support system for first-year students at NJIT. Students will gain the knowledge and resources to reach their maximum potential. The connections they make will help them in the long term to find internships, research assignments and potentially their first career placement. 9. What NJIT department is Learning Community run out of? Learning Community is coordinated by the Office of the Provost. Specific departments in Newark College of Engineering (NCE), the College of Science and Liberal Arts (CSLA), the School of Management (SOM), and the College of Computing Sciences (CCS) run learning communities for their students. 10. Who do I talk to if I have a problem with my Learning Community experience? If there is a problem with the Learning Community experience, please contact the Office of the Provost. 11. Can I be a part of Learning Community after I have a completed my first year at NJIT? The program engages students over three semesters: first and second semesters of the freshman year, and the first semester of the sophomore year. Adjustment to college life in the first year and transition to increasing demands within the major in the second year are the focal points of the program. Upperclassmen may participate as peer mentors. 12. Will Learning Community help me get an internship or research assistantship later in my academic career at NJIT? Learning Community enables students to develop tools, learn about resources, and form relationships with facility members, advisors and upperclassmen that may lead to internship and research opportunities. 13. Can I work while being part of Learning Community? Yes, however you cannot work more than a total 20 hours per week, whether it be on-campus or off-campus employment. Full-time students are strongly discouraged from taking on too much academics should be their priority.